SassyCyclist started with a very simple idea: make a stylish, better fitting, and truly comfortable cycling jersey that women would love to wear. Wouldn’t it be nice to buy a jersey truly true to size? How about reflective material for higher visibility? Wouldn’t it be nice if the jersey stayed put and didn’t ride up? Wouldn’t it be nice to sport a beautiful biking top not covered in logos, racing stripes, or cartoon characters? Something stylish on and off the bike? One day, on the bikes, we decided to make an exceptional cycling jersey for women ourselves and SassyCyclist was born. Since the company started with a singular mission of creating a fantastic jersey, much thought and attention to detail has gone into its creation. SassyCyclist produces stylish garments with lush patterns and colors. Along with a fashion-forward look, our high performance jerseys are wicking, quick-dry, and antimicrobial. Plus, they're quite comfy with a super-soft brushed blend. The SassyCyclist jersey is an instant favorite, the one you always pull from the drawer and happily wear again and again. Proud to say, our jerseys, headbands, and other gear are made at an experienced sportswear manufacturer in Baltimore, Maryland. 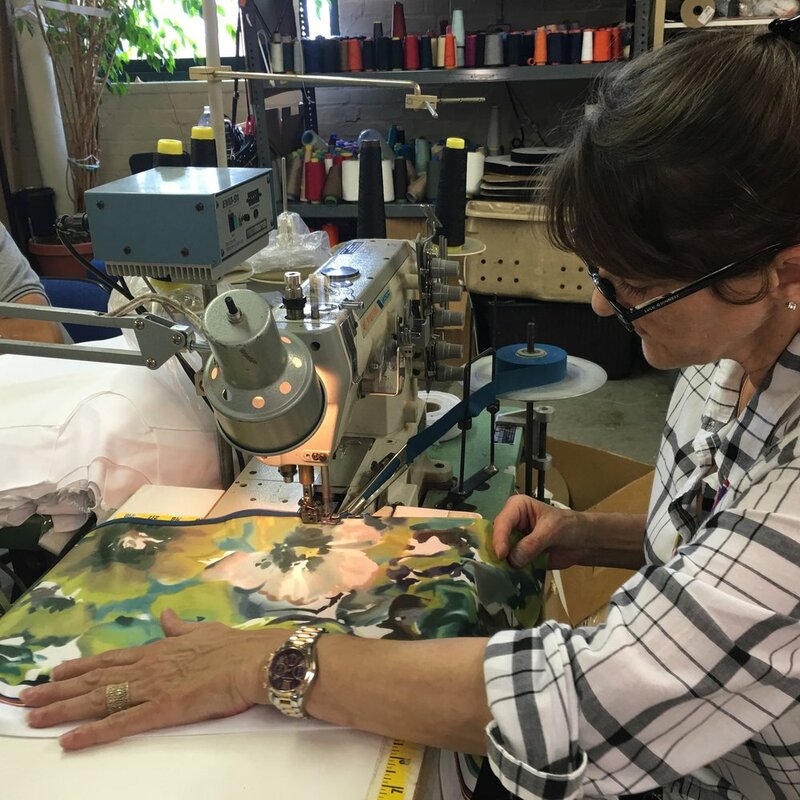 The close proximity of the factory, located a mere 8 miles from our office, allows for a hands-on, collaborative process for product development and the cut and sew production between our company and the manufacturer. The results have been fantastic, along with the partnership.